SAYING that they're the best in the market are what many skin supplements do. But when it comes down to proving it, can they deliver? Ferrosan's skin supplement with its 15-year history and presence in over 70 countries was recently honoured by an international panel of distinguished skin experts. Ferrosan is one of the four finalists chosen by a select group of 50 R&,D experts from around the world in the Best International New Technology Award Category sponsored by Cosmetics & Toiletries Magazine. Ferrosan's products were honoured for the combined system of the Expression Line Control Serum and its Plus (Time Perfection) supplements. The panel was impressed by the scientific data submitted which concluded that the synergetic action of the Expression Line Control Serum and Plus supplements positively impacted the skin's vitality, elasticity and firmness. When combined, the effects offer the most advanced protection against the visible and invisible signs of skin aging. The prestigious Health & Beauty America Industry Awards Program pays tribute to those who have made significant contributions to the cosmetic, personal care and fragrance industries. This article was brought to you by Ferrosan. Singaporean actress Zoe Tay, 38, keeps age at bay with the help of Ferrosan's skin supplements. 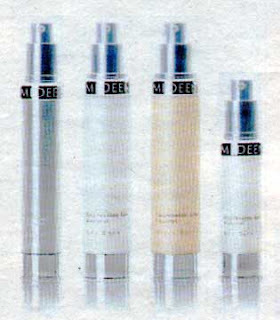 The Imedeen Expression Line Control range.